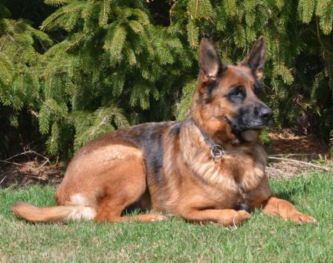 Our German Shepherd Females come from West German Showlines and Czech Working Lines whose lineage have proven themselves on world levels. Rachel achieved her Companion Dog title (CD) in May 2015 and received 3 High in Class and 1 High in Trial. Rachel achieved her Companion Dog Excellent title (CDX) September 2015 GSDCC Canadian National Trials. She received 3 High in Class and 2 High in Trials along with passing her Temperament Test. 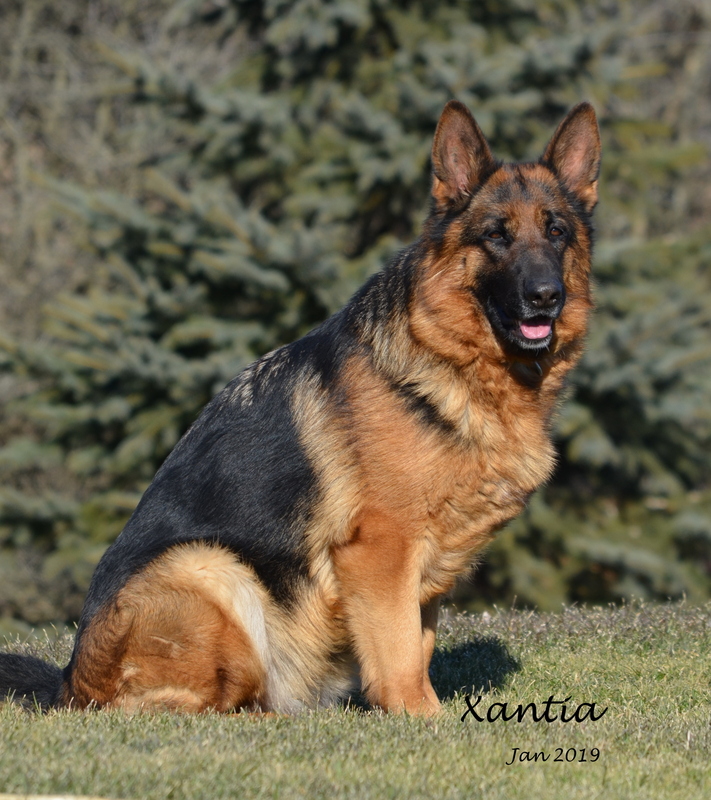 Xantia is a daughter of VA2 Pepino von Arlett (VA Yankee v Feuermelder son). Correct confirmation, nice movement, firm female with black and red colour. 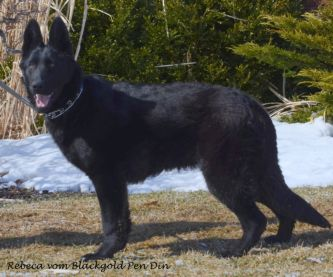 Daughter of “Kira” Vonni vom Blackgold Pen and Marcus vom Pen Din. She is a very rich black and red with a very stable disposition. Kira is now owned by our good friends Joe and Beth. 2015 – Ivy has a new role in life – she has been certified as a Service Dog for Post Traumatic Stress Disorder. Ivy received her CKC CD Title and in 2010 received her SchH Bh. 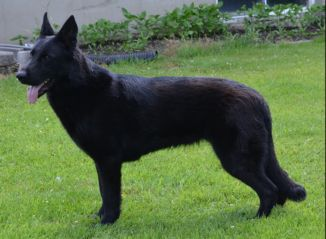 Our Czech import is owned by Pen Din Shepherds and Blackgold Shepherds and resides here at Zavitz Kennels. Mia is a daughter of Flora vom Fleischerheim and Hector vom Fleicherheim. She is currently working on her CKC obedience. Mia inherited Flora and Hector’s super disposition and has a powerful gate with good length of stride. SchH 1 “A1” Hips BH AD ZW-74 DNA. DAUGHTER OF VA10 ORBIT TRONJE! Jill also has a super ZW (Zuchtwert) rating of only 74. 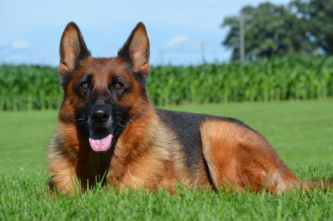 The Zuchtwert is also known as “breed value” and signifies the tendency of a dog to improve on the breed in a breeding scheme that have numbers under 100. This is especially important in hip dysplasia in that this low number implies that her progeny will have less chance of inheritable deficiencies. This is an unusually low (therefore good) number at 74. Inka and Ivy are sired by V1 “Uran vom Moorbeck” making them half sisters to VA2 “Quenn vom Loher Weg”. 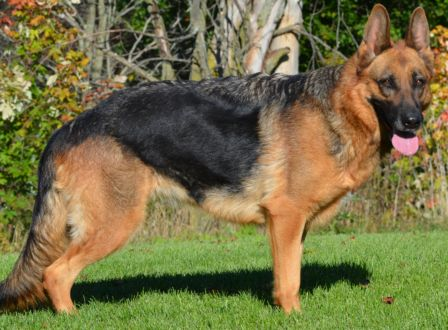 Their mother SG “Jill von Pallas Athene” AD Sch H2 CD CGN is a full sister to “Ussci vom Buchonia”. “Ussci” and “Quenn” are the parents of VA 10 “Godalis Tino”. Inka is currently working towards her BH and Sch H1. Unfortunately Inka had trauma to her left ear as a puppy leaving her with a floppy ear. However this certainly has not affected her working ability and disposition. We are looking forward to future progency. Inka has received her SchH BH and her CKC CD Titles. 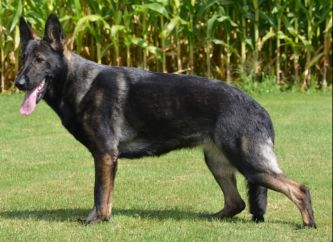 Odessa is a daughter of Jill vom Pallas Athene and V, CH Gerro vom Kirschental SchH1, KKL1. 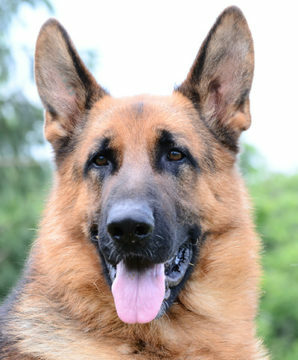 Gerro was imported from the famous Kirschental Kennel in Germany and through him we are bringing the herding working lines in to our kennels. CKC and AKC Registered, OVC, OFA Certified. Breed show rating of “V” or “VA”. Performance titles of Sch H1-3 or equivalent. Recommended for breeding with a breed survey of KKL la. Flora’s dam is “V Ulla vom Almhof SchH1a” who is a daughter of VA1 World Seiger “Ursus von Batu”. Ursus is also the sire of 2X World Sieger VA1 Yasko vom Farbenspiel SchH, Kk1 1a. 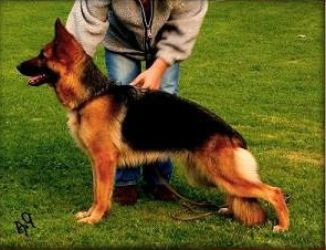 Flora’s sire is “VA Dux della Valcuvia SchH3, Kkl la”. 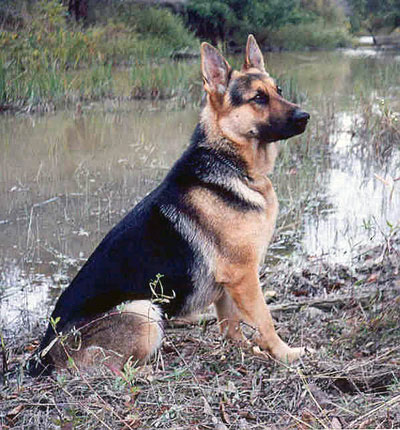 “Dux” is also the sire of 2X World Vice Sieger Quantum von Arminius SchH3, Kk1 1a and VA Marko della Valcuvia. 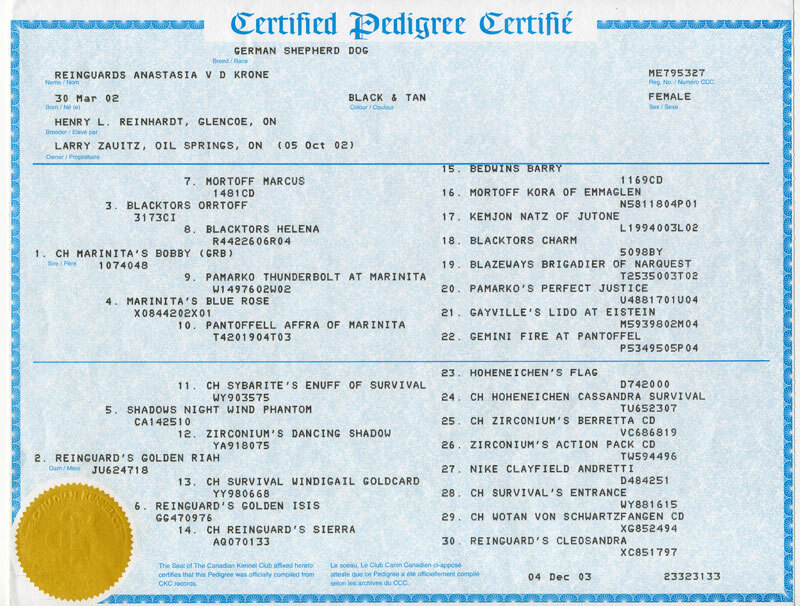 OVC Hips, CGN, CGC, CD, HIC, CKC and AKC Registered. Anna is the foundation of our breeding. We purchased Anna from Reinguard Kennels and were fortunate enough to be allowed to purchase breeding rights. 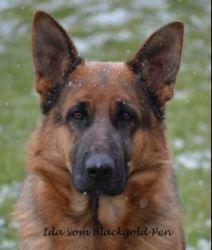 Henry Reinhardt has now since passed away and we are honoured to be able to continue this breeding line. Anna received her Companion Dog Title with three straight High in Class as well as receiving her Canine Good Neighbour and Canine Good Citizen Titles. 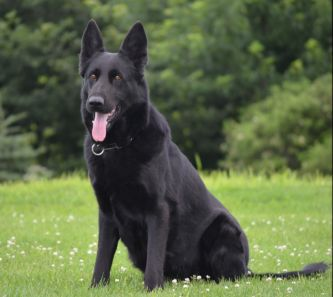 She has a super disposition and a keen intelligence which she has passed onto her progency, producing excellent working dogs such as our own “LKZ Dylan’s Black Gold” and “Black Gold’s Lacey”. Anna is a beautiful black and red female and a pleasure to be around. 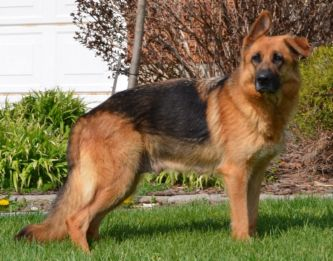 Anna has been retired and has been placed with a loving family.